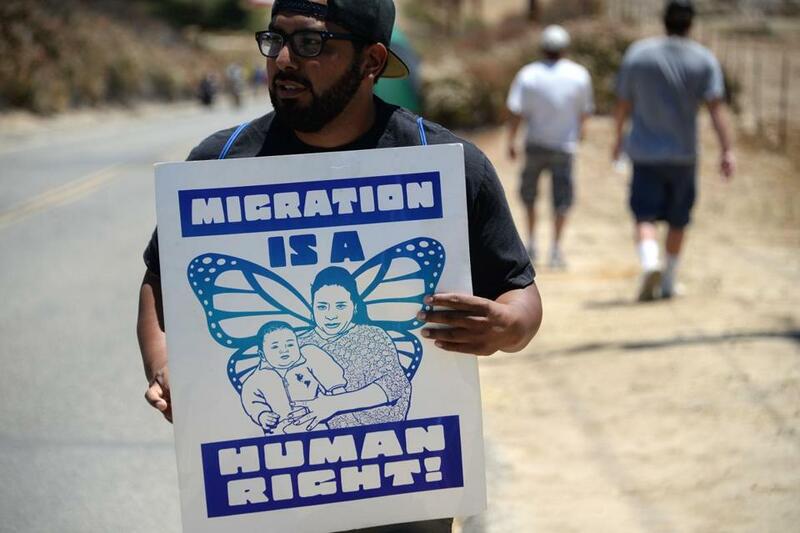 A demonstrator held a sign supporting immigration outside a US Border Patrol facility in California earlier this month. What if the Irish potato famine had happened today? It’s something to think about, in light of Massachusetts’ current role in the immigration debate, when appeals for compassion collide with pronouncements about the law. Here’s where we stand: Governor Deval Patrick makes a passionate pitch for sheltering undocumented children who fled violence in Central America. Four major gubernatorial candidates rush to agree, which says something about Massachusetts character. But public sentiment is split, resistance is vocal and strong, and the language the opponents use is telling. In the 19th century, Irish immigrants were called many of the things you hear hurled at Central American immigrants today: a scourge on public health, a drain on the economy, a threat to American culture. One thing they weren’t called, though, was “illegal,” because that term hadn’t been conceived yet. And yet they could come — with no paperwork issues or quotas or restrictions or immigration courts. Political backlash followed, in the form of secret societies that coalesced into the Know Nothing Party. The Know Nothings grew so popular that, in 1854, they overwhelmingly took over the Massachusetts Legislature — where they pushed for prohibition laws, aimed squarely at Irish and German culture.